by Brown, Walter C.; Dorfmueller, Daniel P.
Print Reading for Construction is designed to assist students in reading and understanding residential and commercial prints. 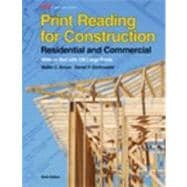 This practical text is suitable for vocational students, apprentices, and building trades workers who want to increase their knowledge of print reading and construction drawings. The combination text and workbook presents a thorough discussion of print reading techniques, starting with the basics of print reading and progressing to advanced topics.